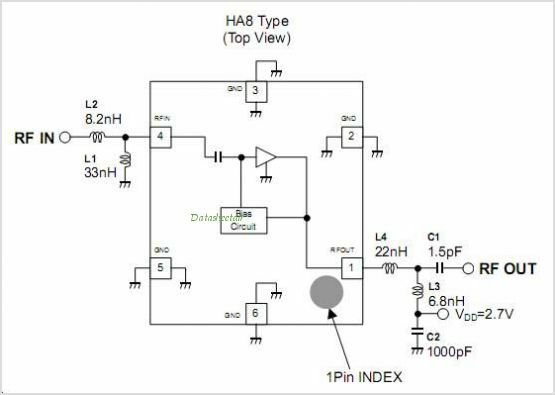 This IC NJG1117HA8 is a Low Noise Amplifier GaAs MMIC designed for GPs This Amplifier provides low noise figure, high gain and high IP3 operated by single low positive power supply.This Amplifier CAN be tuned to wide frequency point(1.5GHz ~ 2.4GHz).An ultra-small and ultra-thin package of USB6-A8 is adopted. This is one package pinout of NJG1117HA8,If you need more pinouts please download NJG1117HA8's pdf datasheet. 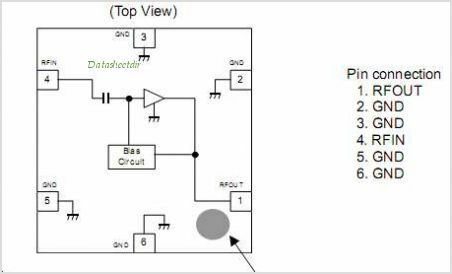 This is one application circuit of NJG1117HA8,If you need more circuits,please download NJG1117HA8's pdf datasheet.